When you are looking for a charter bus service in San Francisco, you want one that has it all. Furthermore, you deserve to receive only professional and courteous service from start to finish in your interaction with the charter bus company. However, when you are looking at all the charter bus companies in the area, you might not be able to accurately determine which one will truly offer you the service that you’re looking for. A great transportation experience is essentially invisible. It’s when service is lacking that you notice it. For this reason, it can be hard to know what questions you should be asking to uncover the companies that truly set themselves apart. It’s worth it to make the effort to do this, however, because the right charter bus service can enhance the enjoyability of your whole trip, and the wrong one can threaten to leave a bad taste in the mouth of you and your guests. Here are some of the things that our charter bus rental company in San Francisco offers that you should expect to find in the best charter services. When a charter company tells you about your fleet, it’s important to listen for whether it sounds like they will have a vehicle that corresponds closely to the size of your group. It costs a bit more to book a bigger bus, simply because there are additional expenses for fuel and wear-and-tear on a more complex vehicle. If you have a group size of 12 and the only size bus that the company can offer you is something that seats 40 people, that’s not going to be the most efficient use of your funds. On the other hand, if you have a big group and the charter company’s fleet doesn’t have a larger bus, it’ll probably end up being more expensive for you to hire two buses because they will have to employ two drivers instead of one for the job. All this is to say that you should choose a charter service that has a large fleet, from minibuses to full-size tour buses. The longer you sit in an uncomfortable seat, the more you and your guests will experience discomfort, cramping muscles, aching backs, and unhappy joints. The padding in the seats eventually gets hard and worn out, so look for a company that remodels the interior of their buses periodically. This should be automatic, but you’d be surprised how often it’s not the case. Ask to see the inside of their bus before your rental to get an idea of the cleanliness you’ll encounter. It’s not always possible for buses to run on time, but the best bus companies plug in adequate padding into their schedule in order to offer an accurate quote to customers and achieve on-time service, even when there are unforeseen delays like traffic or road closures. You and your passengers deserve to feel safe when you are in the hands of your bus driver. In prior blog posts, we covered some of the things that make a great charter service driver and how a good driver helps you to be safer. 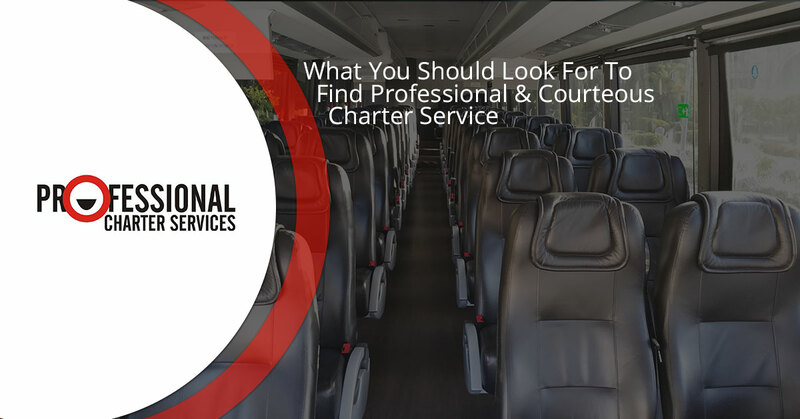 Get a free quote for your charter bus rental with Professional Charter Services today!